A national consultation on Polices and Measures (PAMs) to address drivers of deforestation and forest degradation was organized on 10 June 2018 at the Forest Department in Bangladesh. Forest Department organized the workshop with support from UN-REDD Bangladesh National Programme. More than 60 representatives from the MOEF, different concerned ministries and agencies, Bangladesh Forest Department, Co-Management organizations, NGOs, research organization, universities, and private sectors participated at the workshop and provided their expert opinion and suggestions in the context of Bangladesh. Mr. Rakibul Hasan Mukul, Conservator of Forests & National Project Director of UN-REDD Bangladesh National Programme briefed about objectives and expected outcomes National Consultation. He also stressed the importance of identifying PAMs in the context of development of national REDD+ strategy. Chief Guest of the workshop, Mr. Abdullah Al Mohsin Chowdhury, Secretary, Ministry of Environment and Forest informed that "there are existing policies and measures for betterment of forestry sector; however, the objective of previous and today’s exercise is to focus on those policies and or measures that can address drivers of deforestation and forest degradation". 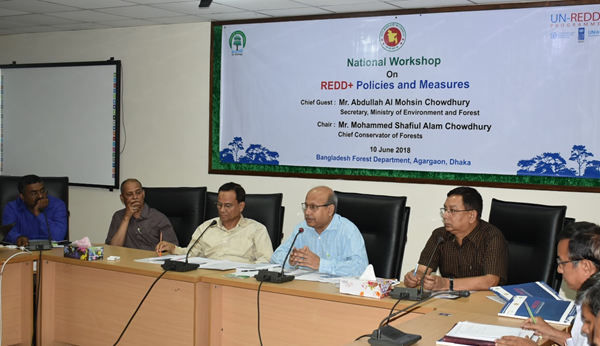 Mr. Mohammed Shafiul Alam Chowdhury, Chief Conservator of Forests, Bangladesh Forest Department stressed that "attainment of appropriate management of forest resources is the key objective which can ensure sustained supply of forest services".